You know your diet should be rich in plants for optimal health. So shouldn't the products you apply to your skin, which are absorbed into your body, also be filled with plants? If you've ever looked at the back of your so-called "natural" facial moisturizer or body cream and seen a list of complicated additives you couldn't recognize or pronounce, then you know firsthand that mass-produced synthetic beauty products can be something of a mystery. With Plant-Powered Beauty: The Essential Guide to Using Natural Ingredients for Health, Wellness, and Personal Skincare (with 50-plus Recipes), harness the power of plant-based energy to maintain your natural beauty and let your skin glow like never before. Natural beauty experts Amy Galper and Christina Daigneault show readers how to deconstruct beauty labels, parse ingredients lists, make informed choices about the products they use--and, most important, better understand how their skin works. 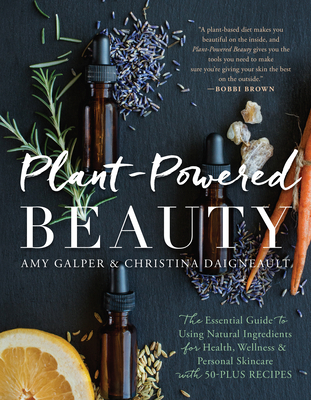 Plant-Powered Beauty unlocks sought-after wisdom for all aspects of plant-based personal skincare and celebrates the shift in beauty trends, bringing us back to natural beauty and reconnecting us with plants and healthy choices. Amy Galper, M.A., Dipl. AT, is the Executive Director and Founder of New York Institute of Aromatherapy, and is a nationally celebrated advocate, entrepreneur, formulator, and consultant in organic beauty and wellness. She is a pioneer in the field and created the award-winning, yoga-inspired line of body care products called Buddha Nose, one of the first organic brands to create national awareness of the need for toxin-free beauty and body care products. Amy also produced a series of interactive pop-up shops called The Yoga Beauty Bar to celebrate artisan organic beauty brands while educating women to make more conscious beauty choices. Amy has appeared as a featured speaker at the Indie Beauty Expo, Women in Flavor & Fragrance Conference, and EcoSessions. She has been a guest lecturer at New York University, NSU College of Pharmacy, and is a member of the Visiting Faculty at Arbor Vitae School of Traditional Herbalism in New York City, at The School of Aromatic Studies. Amy has also been featured in dozens of top media outlets including Cosmopolitan, Dr. OZ, Prevention, Well and Good, Mind Body Green, People, Allure, Refinery29, FOX news, and CUNY TV. Christina Daigneault is an attorney and the president of Orchard Strategies, an award-winning public relations and marketing company. She is also a certified aromatherapist and beauty product formulator. Through Orchard, Christina works with lifestyle businesses and corporate leaders worldwide. She has won numerous industry awards, and regularly speaks at forums and universities about women in business and leadership. She has been featured in media outlets including The New York Times, The New York Law Journal, CBS Radio, NY1 News, and NBC News. Christina discovered the benefits of natural beauty and plant-based medicine through her work representing top brands and experts, and soon started to apply natural practices to her own life. She earned a certification in aromatherapy from the New York Institute of Aromatherapy and also studied at the esteemed Maison Fragonard in Paris.